It get's harder and harder to find a way to raise the bar from the last issue of Fireworks… that said, we've managed it with Fireworks Issue 60! If the fact that the 96 glossy colour pages are absolutely packed with quality artists, interviews and reviews isn't enough to justify the price tag, how about the fact that the FREE CD contains SIXTY EIGHT FREE SONGS in mp3 format for you to check out - an increase of SIXTEEN TRACKS from last issue! The CD also contains a FREE PDF telling you all about each artist on the disk so you know who to look for if you hear something you like. The magazine itself continues the fine tradition of bringing you interviews with the great and the good. Def Leppard talk 'Viva Hysteria', guitar hero Joe Bonamassa speaks about his 'Tour De Force', Alter Bridge chat about their new album 'Fortress' and Dream Theater are back with us too. We've not even mentioned Ted Nugent, John Waite, Devin Townsend, Chris Norman, Adler, Terry Reid, Gov't Mule, Fergie Frederiksen, Lars Eric Mattsson… 32 interviews in total! 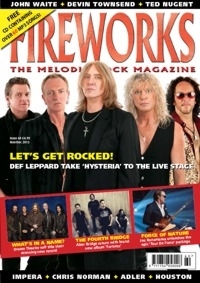 Fireworks #60 also hosts the most in depth reviews section on the market, as we review over one hundred new albums, alongside live reviews, reissues, DVDs, books and EPs. If you want to stay in the loop, Fireworks #60 is the way to do it! Fireworks Magazine Online 60 - Interview with WolfpakkWOLFPAKK Wolf Gant discusses new Wolfpakk album ‘Cry Wolf’ with vocalist Mark Sweeney.